Ben Lerner’s second novel 10:04, like its predecessor Leaving the Atocha Station, is a novel that feels like a memoir. Unlike his debut novel—in part because of its critical success and the promise of a sizable advance for his next novel (the one we are reading)—this time Lerner’s first-person narrator fictional self is more self-confident and self-assured, less depressed, tells fewer lies, is not only better behaved but tries to be a mensch, and has greater success connecting to others. In the previous novel his protagonist’s fears and anxieties turn out to be exaggerated and unwarranted, but this time the fictional Lerner has a real potentially life threatening medical condition, a minuscule perforation in his aorta, that must be monitored. Also like LTAS, in which the affections of our American poet spending the summer of 2005 in Spain on a Fulbright are divided between a Madrid girlfriend and his equally attractive female translator, in 10:04 Lerner’s primary relationship is a platonic friendship with Alex, his 39-year-old best friend who wants to have a child and wants Lerner to be the child’s father/sperm-donor. Lerner’s relationship with his girlfriend Alena seems more like a casual friendship with sexual benefits (the beta-blockers he takes for his heart condition are apparently at a low enough dose that he can still get erections). Lerner is inclined to help Alex have a child but is initially unsure how much of a parental role he is willing to undertake; the casualness of his relationship with Alena reduces the issue of jealousy. And where LTAS is set in a part of Madrid neighboring the titular Atocha station where a mass murder terrorist attack takes place about halfway through the book,10:04 is set in New York City during the 14 months between Hurricane Irene and Superstorm Sandy. In both books the historical events give Lerner’s personal narrative a larger context. 10:04 has two recurring motifs that act as organizing principles. The first is its epigraph, a Hasidic quote about the world to come that says everything will be the same, just a little bit different, which in this context does not refer to the afterlife but to this life in the near future: as events unfold in the novel they are what the fictional Lerner expected they would be only a bit different. The second recurring motif is the word proprioception meaning one's mind's awareness of the actions of one's limbs, which refers to how events in Lerner’s outer life are experienced by his inner life in a manner analogous to the brain's awareness of the activity of its body. This and other concepts are illustrated with a dozen photographs that appear throughout the text. The book is divided into five chapters, the first of which introduces the characters, sets the situation, and includes various asides such as how the speech Peggy Noonan wrote and President Reagan delivered on the occasion of the Challenger disaster in 1986 influenced the seven-year-old Lerner to become a writer. The second chapter is a work of fiction within the novel that retells some of the first chapter with different names. The final three chapters’ scenes include a visit to a hospital masturbatorium for sperm donors; a shift at the Park Slope Food Co-op; Lerner’s tutoring a Hispanic boy named Roberto and how that relationship helps Lerner explore his feelings about parenting; and a residence at a writer’s colony in Marfa, Texas, where Lerner takes in local attractions on side trips and takes drugs contraindicated for his heart condition at a party, writes poetry instead of prose fiction, and decides to scrap an earlier concept for his novel and instead write the version we are reading. 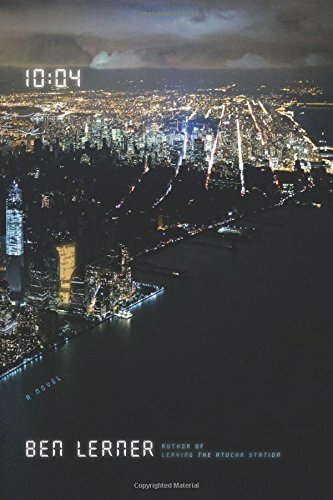 The final chapter ties up loose ends and includes a walk Ben and Alex take in post-Sandy New York City from her medical appointment in Washington Heights down through the length (including the blacked out lower section) of Manhattan and back to Brooklyn.